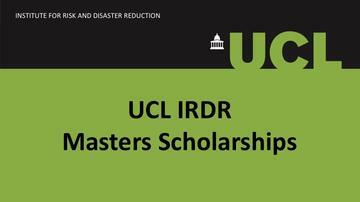 We are delighted to announce four scholarship awards for overseas fee paying MSc and MRes students in the UCL Institute for Risk and Disaster Reduction for academic year 2019/20. Scholarship 1 (two awards): £12,500 towards overseas tuition fees. Scholarship 2 (two awards): £5,000 towards overseas tuition fees. Please ensure that all applications precisely follow the guidelines given in the application instructions. * ODA nations are those on the January 2015 DAC list of ODA Recipients, which shows all countries and territories eligible to receive official development assistance (ODA), based on GNI per capita published by the World Bank.